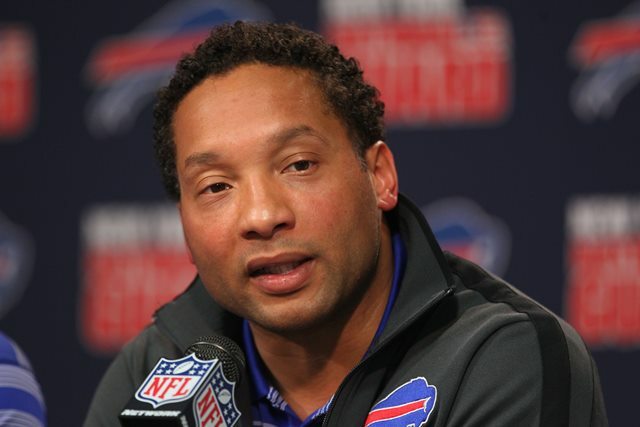 A few minutes into the Bills’ pre-draft luncheon on Friday, someone asked general manager Doug Whaley if the pending ownership change could affect negotiations with Marcell Dareus on a long-term contract. Whaley said he would focus on such issues after the draft. Ownership has no bearing. Russ Brandon, the president and CEO, added a swift assent from his corner of the media room at One Bills Drive. That’s true, if you believe it’s normal to conduct business in the country’s most popular and lucrative sport without knowing who your owner is going to be, or whether anyone in the organization has long-term job security. Someone is going to buy the Bills for upwards of $1 billion. No doubt, there will be a thorough evaluation of the entire operation. So there must be a heightened sense of urgency and unease in the front office as the team prepares for the first day of the NFL Draft on May 8. Whaley had a stock reply when he was asked about the urgency of the moment. Twice, he said the NFL is a “results-driven business.” In other words, you’re judged by your record. No one’s job is guaranteed for long — especially now that Ralph Wilson isn’t around to protect the less competent personnel men. The Bills have missed the playoffs 14 straight years, the longest such streak in the league. They’ve strung together three straight 6-10 seasons. Sure, they showed signs of progress in Doug Marrone’s first year as coach. But they need to quickly separate themselves from their dysfunctional past. I imagine that would be the case regardless of the ownership situation. Still, the urgency is even more pronounced now, amid the uncertainty over who will purchase the team and how they might proceed with the football operation. One thing does not change, and Whaley acknowledged it during the 45-minute draft session. Ultimately, his early drafts will be judged by the success or failure of quarterback EJ Manuel. Whaley didn’t run from it. He didn’t point out that Buddy Nix was still the nominal GM when the Bills drafted Manuel. Manuel is his guy. He has to get better for the Bills to take that next step. Whaley has made some good moves since becoming GM. But the best way to show a new owner that you’re making real progress and changing a losing culture is to have a franchise quarterback in place. “It’s a quarterback-driven league, so we’re going to give every avenue and every piece of the puzzle to surround EJ and make him as successful as possible,” Whaley said. “What we did this offseason affords us the opportunity to go any way and every way in this draft. OK, so it’s a “results-driven league” and a “quarterback-driven league.” It’s safe to assume, then, that a team’s fortunes are largely driven by the results of the quarterback. So when you have a young, evolving franchise QB, the chief objective in the draft is giving him the tools to succeed. The Bills started it in last year’s draft, when they took wide receivers in the second (Robert Woods) and third (Marquise Goodwin) rounds. Remember, Marrone is an offensive coach by trade. He turned around the Syracuse program when he went to a more dynamic, cutting-edge offense. So Whaley is almost certain to follow that blueprint when the draft begins 11 days from now, by emphasizing offense in the early rounds. Virtually all the speculation has the Bills picking either a wide receiver, a tight end or an offensive tackle with the ninth overall pick. Whaley said the team’s offseason moves have positioned the Bills to take the best player available with the ninth pick. He said it was easy to trade a sixth-round pick for troubled wide receiver Mike Williams because it would be difficult for a sixth-round pick to make the squad this season. That’s a justifiable claim, but it also tells you the Bills believe they have built the roster to the point where they should be expected to contend for a playoff spot this year. The skeptics in the crowd will file it away for now. Manuel needs to show progress, and he needs to stay healthy. The learning curve is accelerating for young QBs. Russell Wilson won the Super Bowl in his second season. The Bills are in a “win-now” mode, and as Whaley conceded, the main issue is helping Manuel justify the franchise label. Any of the three options could help Manuel right away. Wide receivers can be slow to develop, but Sammy Watkins or Mike Evans could contribute immediately and give the Bills a true No. 1. Eric Ebron is an immense talent who could give them the kind of dual tight end threat that the Patriots had when Aaron Hernandez was still walking the streets and Rob Gronkowski was healthy. An offensive tackle makes a lot of sense, too. It’s fashionable to suggest that offensive linemen aren’t worth high picks anymore. But the last two Super Bowl winners each had a tackle who was drafted in the top 10. Both of the Niners’ tackles went in the first round. So did the Pats’ Nate Solder. If the Bills want to help Manuel, that means protecting him. The biggest issue last year wasn’t his throws, it was keeping him healthy. He was under a lot of pressure, particularly in his road games and often from his right side. Thad Lewis got run over early and often in the loss in New Orleans. One of the elite guys, like Jake Matthews, could give the Bills one of the top young tackle tandems in the NFL with Cordy Glenn. I imagine drafting a tackle who could start for a decade appeals to Marrone, a former offensive lineman. Last year, Whaley got his quarterback. This year, he intends to get him more help. A lot of people, including some prospective owners, will be watching very closely next fall to see if he actually gets results.